As our semester came to an end we, of course, had to have one last class outing. 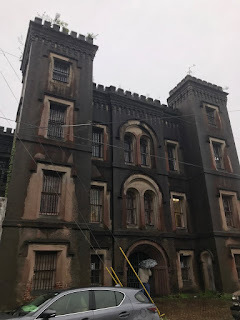 Last Monday our class took a walk through the rain to the take a tour of the haunted Old Charleston Jail with Bulldog Tours. Our tour guide, Randall (Randy) Johnson, had the perfect mix of humor, information, and creepy stories to help make the experience one of a kind. The historic and creepy building was opened up in 1802 and remained in use until 1939. The jail was used as a regular confinement center throughout the years but also as a prisoner of war jail. To open up the tour Johnson started off with some historical facts and disclaimers. 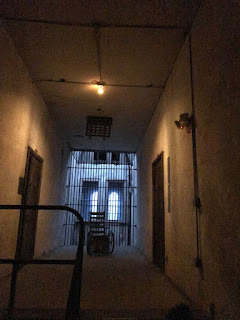 He told us how the jail is indeed haunted and there will probably be some unexplainable experiences within those walls. He informed us that common paranormal experiences reported by tour groups could include: a slab of meat on your shoulder throughout the tour, tingles, being poked, stoking of hair, and auditory experiences. It is estimated that 14,000 people have died in the jail or on the grounds. Disease was the most common killer during the time that it was open. Yellow fever took the lives of many within those walls. There was also the major earthquake that hit Charleston in 1886 that killed numerous people inside. On top of disease and natural disaster, the treatment of inmates was terrible and there was no electricity or plumbing built into the building and as Johnson said "being in here [the jail] was basically a death sentence". Johnson told stories about some particularly "savage" inmates, one of which was about Lavinia Fisher who was reported to be the first female serial killer in the United States. She was responsible for luring in and killing hundreds of men. Johnson also told us that her spirit has been known to scratch or mess with men on the tour, which was concerning for a few classmates. We toured the main level and basement level of the jail which reportedly has the most paranormal activity. The basement was where most mentally ill inmates would be put. Due to lack of mental health knowledge, the treatment of "ill" inmates was the worst. The guards did not know what to do with them so they were put in extremely small cages that stopped any extra movement and would be left there for weeks. The haunted tour was a good way to wrap up the semester. I think the class had a good time and enjoyed touring it. College of Charleston first year student. From Atlanta, Ga.